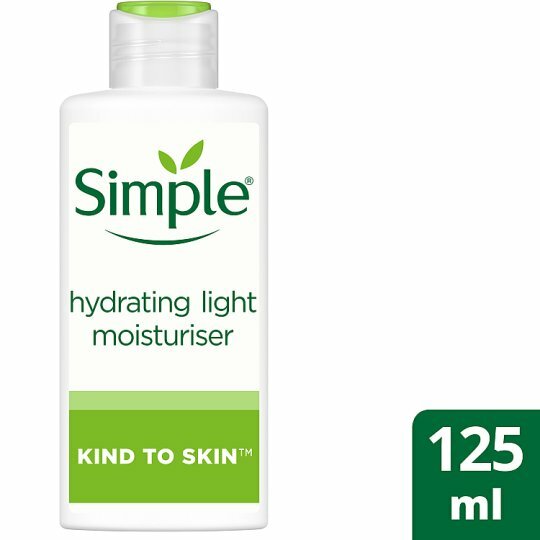 Simple® Kind to Skin Hydrating Light Moisturiser provides care with a light feel on skin, keeps skin refreshed, replenished and hydrated for up to 12 hours. If you are looking for a moisturiser that leaves skin feeling soft, smooth and perfectly hydrated then look no further as our Simple® face moisturiser does just that. Our face moisturiser also helps to maintain healthy skin. It’s made with skin loving ingredients and pro-vitamin B5 & vitamin E, contains no artificial colour or perfume and no harsh chemicals that can upset your skin, perfect for sensitive skin. With our Simple® light moisturiser offering gentle care for healthy hydrated skin everyday, it also provides a lightweight and fast-absorbing formulation. It’s a light face moisturiser that is hypoallergenic, non-comedogenic (meaning it doesn’t clog pores), dermatologically tested and approved. Moisturisers, in general are designed to prevent moisture loss. Our Simple hydrating light moisturiser works for up to 12 hours to keep skin moisturised and perfectly hydrated. Whether you’re looking for a hydrating face cream, light moisturiser or just that go-to product to use after cleansing, our simple hydrating light moisturiser is the perfect addition. For best results and how to apply: It’s best to apply moisturiser after cleansing and toning the face, so that skin is clean and free from dirt, make-up and impurities. This way, the moisturiser can really be absorbed by the skin and can reach down into the skin’s deeper surface layers. This then enables the moisturiser to work on the skin from deep within. Step 1: Apply a hazelnut sized portion of the Simple® moisturiser into your hands. Step 2: Smooth gently into your face and neck using upward and outward movements. Use alongside Replenishing Moisturiser. This Simple moisturiser is an spf moisturiser.